In March 2019, China's manufacturing purchasing managers index (PMI) was 50.5 percent, an increase of 1.3 percentage points from last month, and rose above the threshold again. In view of the sizes of enterprises, the PMI of large-sized enterprises was 51.1 percent, decreased 0.4 percentage point from last month, and was higher than the threshold; that of medium-sized enterprises and small-sized enterprises were 49.9 and 49.3 percent, which increased 3.0 and 4.0 percentage points from last month respectively. Among the five sub-indices composing PMI, the index of production、the new orders index and supplier delivery time were higher than the threshold, the index of main raw materials inventory and employed person index were lower than the threshold. Production index was 52.7 percent, increased 3.2 percentage points from last month, and was rose above the threshold again, indicating that the companies started to work together after the Spring Festival, and the pace of Manufacturing production has accelerated. New orders index was 51.6 percent, an increase of 1.0 percentage point month-on-month, and was higher than the threshold for two consecutive months, showing that the manufacturing market demand was continually increased. Main raw materials inventory index was 48.4 percent, increased 2.1 percentage points from last month, and was still lower than the threshold, indicating that manufacturing industry’s main raw material inventory decreased, while the decline of manufacturing industry’s main raw material inventory has narrowed. Employed person index was 47.6 percent, increased 0.1 percentage point from last month, lower than the threshold, indicating that the decline of manufacturing enterprises’ labor employment has narrowed. Supplier delivery time index was 50.2 percent, increased 0.4 percentage point from last month, and was higher than the threshold, indicating that the delivery time of manufacturing raw material suppliers has accelerated than last month. 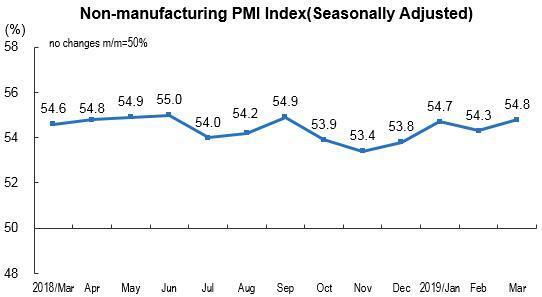 In March 2019, China's non-manufacturing purchasing managers index was 54.8 percent, an increase of 0.5 percentage point from the previous month, indicating that the total of non-manufacturing maintained a steady rapid growth. In view of different industries, non-manufacturing purchasing managers index of service industry was 53.6 percent, an increase of 0.1 percentage point from the previous month, and the service industry develop stable. Of which, the indices of railway transport, Loading, unloading and portage and Storage, Post, Telecommunications, broadcasting, television and satellite transmission services, internet software information technology service, Monetary financial services, capital market services and insurance were positioned in the high level of the range which above 57.0 percent, and the total volume achieved rapid growth, and business activities are positive; The indices of Accommodation and Real estate were lower than the threshold, and the total volume of business was decreased. Non-manufacturing purchasing manager index of construction industry achieved 61.7 percent, an increase of 2.5 percentage points from the previous month, and rose into the high level interval again. New orders index was 52.5 percent, increased 1.8 percentage points from the previous month, and was higher than the threshold, indicating that the amount of non-manufacturing industry’s market demand increased month-on-month. In view of different industries, the new orders index of service industry was 51.5 percent, increased 1.0 percentage point from the previous month, and was higher than the threshold. The new orders index of construction industry was 57.9 percent, increased 5.9 percentage points from the previous month, and was rose into the high level interval. Input price index was 52.5 percent, down by 0.2 percentage point from the previous month, and was higher than the threshold, indicating that the total of input price increase during the process of non-manufacturing enterprises’ operating activities has narrowed. In view of different industries, the intermediate input price indices of service industry was 52.2 percent, decreased 0.3 percentage point from the previous month. The input price index of construction industry was 54.0 percent, an increase of 0.4 percentage point from the previous month. The sales price index was 51.0 percent, up by 0.9 percentage point from the previous month, and was higher than the threshold, indicating that the overall level of non-manufacturing sales prices kept increased. In view of different industries, the sales price index of service industry was 50.6 percent, an increase of 0.8 percentage point from the previous month. The sales price index of construction industry was 53.2 percent, an increase of 1.5 percentage points from the previous month. Employment index was 48.7 percent, increased 0.1 percentage point from the previous month, and was lower than the threshold, indicating that the amount of non-manufacturing enterprises’ labor employment decreased month-on-month. In view of different industries, the employment index of service industry was 47.8 percent, unchanged from the previous month. The employment index of construction industry was 54.1 percent, an increase of 0.9 percentage point from the previous month. Business activities expectation index was 61.1 percent, a decrease of 0.4 percentage point from last month, and was still located in the high level of the range, indicating that non-manufacturing enterprises companies were continually to optimistic about market development expectations. In view of different industries, the business activities expectation index of service industry was 60.3 percent, a decrease of 0.3 percentage point from the previous month; that of construction industry was 65.7 percent, a decrease of 1.0 percentage point from last month. In March 2019, China's Composite PMI Output Index was 54.0 percent, an increase of 1.6 percentage points from last month, indicating that the expansion of the overall production and operation activities of Chinese enterprises has accelerated. Purchasing Managers Index (PMI) is an index summarized and compiled through the results of the monthly survey of enterprises purchasing managers. It covers every links of the enterprises, including purchasing, production, logistics, and so on. It is one of the leading indices which was commonly adopted by international society to monitor the macroeconomic trends, and played an important role in forecasting and monitoring. 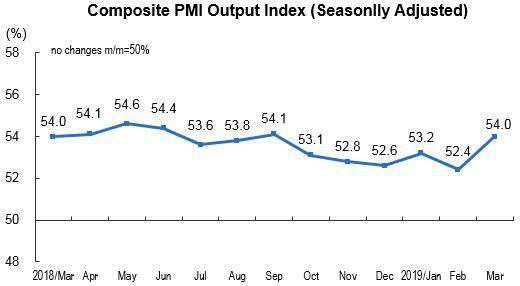 The Composite PMI Output Index, belonging to the PMI indicator system, is a composite index reflecting the changes in the output in current period of the entire industry (manufacturing and non-manufacturing industries). The threshold of PMI is usually using 50 percent as the cut-off point for economic performance. 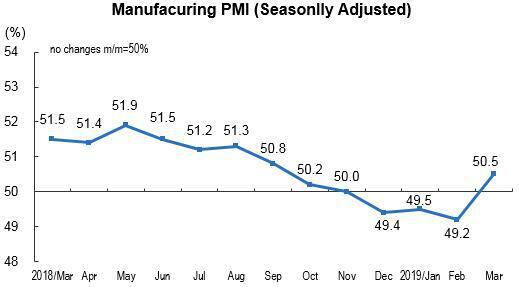 If PMI above 50 percent, it reflects the overall economy is expanding; if less than 50 percent, it reflects the overall economy is in recession. The survey involves 31 divisions of manufacturing industry in the “Industrial Classification for National Economic Activities” (GB/T4754-2011), and 3000 samples, as well as 31 divisions of non-manufacturing industry, and 4000 samples. PPS (Probability Proportional to Size) sampling method was adopted in purchasing managers’ survey. Using the divisions of the manufacturing or non-manufacturing industry as the selecting strata, the sample size of each division is proportional to its proportion of the value-added of the division to the total value-added of the manufacturing or non-manufacturing industry. Within the stratum, the samples are selected according to the probabilities proportional to their principal business revenues of the enterprises. (1) Calculation Methods of Sub-indices. The indicator system of manufacturing purchasing managers’ survey covers 13 sub-indices such as production, new orders, export orders, existing orders, finished goods inventory, purchase, import, purchase price, producer price, raw materials inventory, employees, suppliers, delivery time, production and business activities expectation. Non-manufacturing purchasing managers survey involves 10 questions on production, new orders (business required), export, existing orders, finished goods inventory, intermediate input price, subscription price, employees, suppliers delivery time, and business activities expectation. The indicator system of non-manufacturing purchasing managers’ survey covers 10 sub-indices such as business activities, new orders, new export orders, existing orders, finished goods inventory, intermediate input price, subscription price, employees, suppliers delivery time, and business activities expectation. Sub-indices adopt diffusion index calculation method, i.e. percentage of positive answers in number of enterprises plus half of the percentage in the same answers. Due to the lack of synthesis of non-manufacturing integrated PMI index, the international society often used business activity index to reflect the overall changes in non-manufacturing economic development. (2) Calculation Methods of Manufacturing PMI. Manufacturing PMI was calculated according to five diffusion indices (group indices) and their weights. 5 group indices and their weights are determined in accordance with their leading impact on the economy. Specifically, new orders index weighted 30 percent; production index weighted 25 percent; employees index weighted 20 percent; supplier delivery time index weighted 15 percent; raw materials inventory index weighted 10 percent. Of which, the supplier delivery time index is a converse index, and contrary calculation is needed when combines it into PMI. (3) Calculation Methods of Composite PMI Output Index. Composite PMI Output Index was calculated by weighted summation of the manufacturing output index and non-manufacturing business activity index. Their weights are determined by the proportion manufacturing and non-manufacturing industries in GDP. This index will be released since February 2018.